​Our﻿﻿ ﻿Caribbean Jumbo Ham﻿mocks ﻿﻿﻿bring style and relaxation to any location. These stylish, well-built hammocks are hand-woven from soft spun polyester. Unlike cotton hammocks, they will not rot, mold or mildew. The hammock bed is woven with an extra tight micro-weave design providing the ultimate in comfort and stability. The wood spreader bar has multiple coats of marine varnish to protect it from the elements and is a full 55 inches wide providing ample room for one or two people. This hammock hangs easily from two suspension points at least 12.5 feet apart. These are the largest and most comfortable hammocks anywhere. ​Our Caribbean Jumbo Hammocks with Siberian Larch Wood Arc Hammock Stand Package brings style and relaxation to any location. These stylish, well-built hammocks are hand-woven from soft spun polyester. Unlike cotton hammocks, they will not rot, mold or mildew. The hammock bed is woven with an extra tight micro-weave design providing the ultimate in comfort and stability. The wood spreader bar has multiple coats of marine varnish to protect it from the elements and is a full 55 inches wide providing ample room for one or two people. This hammock hangs easily from two suspension points at least 12.5 feet apart. These are the largest and most comfortable hammocks anywhere. The Siberian Larch wood stand is 13 feet long. Enjoy this well-built hammock on a stand that was created for this hammock. 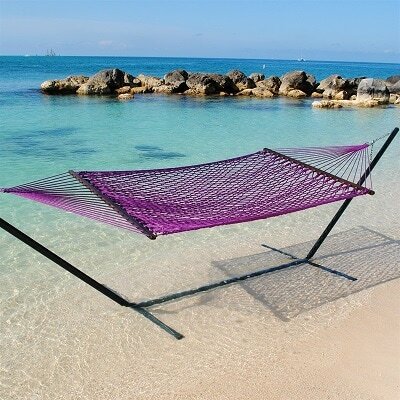 Purchase this hammock with stand and save. 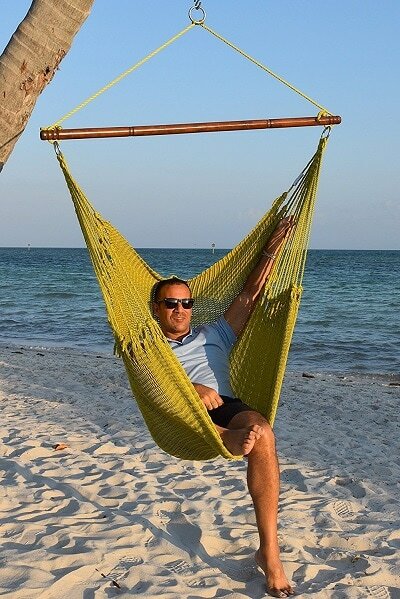 ​Our﻿﻿ Caribbean Jumbo Hammock Chairs are hand-woven from Soft-Spun Polyester cords. They have a softer feel and are more weather durable than cotton hammocks. At 55 inches wide, this hammock chair offers you plenty of shoulder room, an oversized seat, along with a built in footrest. Construction from quality materials and ample dimensions combine to make this hammock chair the most comfortable seat in the house. This chair hangs easily from one suspension point that is 8 feet or higher. There are many color options. Our Caribbean Large Hammock Chairs are hand-woven from Soft-Spun Polyester cords. They have a softer feel and are more weather durable than cotton hammocks. At 47 inches wide, this hammock chair offers you plenty of shoulder room, an oversized seat, along with a built in footrest. Construction from quality materials and ample dimensions combine to make this hammock chair the most comfortable seat in the house. This chair hangs easily from one suspension point that is 7.5 feet or higher. Choose your color now! 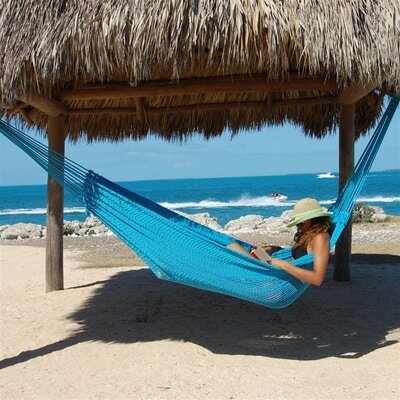 ​Our﻿﻿ Caribbean Mayan Hammocks bring style and relaxation to any location. These stylish, well-built hammocks are hand-woven from soft spun polyester. Unlike cotton hammocks, they will not rot, mold or mildew. The hammock bed is woven with an extra tight micro-weave design providing the ultimate in comfort and stability. This hammock hangs easily from two suspension points at least 12.5 feet apart. These are the largest and most comfortable hammocks anywhere. ​Our Caribbean Rope Hammocks are hand-woven from Soft-Spun Polyester cords. They have a softer feel and are more weather durable than cotton hammocks. At 55 inches wide, this hammock offers you plenty of shoulder room for one or two. These are the largest and most comfortable rope hammocks anywhere. Choose your color now! ​Our﻿﻿ Siberian Larch Wood Arc Hammock Stands are crafted from multiple laminated layers of natural Siberian Larch wood for superior strength and support. Each layer is hand bent and radio frequency glued to form thicker, heavier beams that are characteristically arc shaped. Meticulous sanding is followed by multiple coats of marine varnish to achieve a stylish high gloss finish. 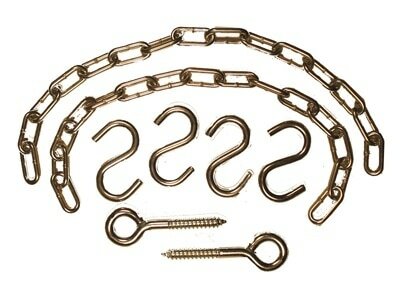 All the hammock stand hardware is Stainless Steel arranged into a double screw design for extra strength and stability. 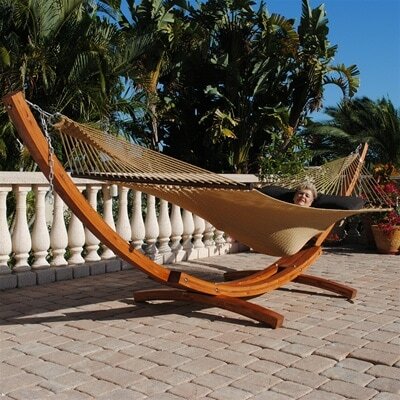 This hammock stand is 13 feet long and designed to work in conjunction with our Caribbean Jumbo Hammocks. The hardware used to hang a hammock is made of galvanized steel. Assembly is required. Our EZ Hammock Hardware makes it easy to hang any hammock any where. 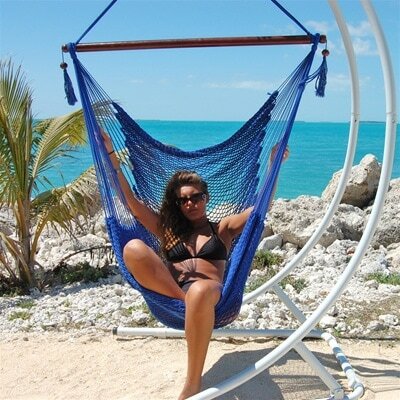 All our top quality Caribbean hammock hanging kits are Zinc plated to protect against rust. The suspension hardware is conveniently packaged in one small pouch offering a safe and simple method to quickly hang your hammock from wood, trees or concrete. Select your configuration now.